Picking the destination is the hardest part, because there is so much to see in so little time. Now that you’ve picked a destination, you have to put together a budget to see how much you need to save for. You’ll want to include all things that you will be spending money on, that way you’re prepared. Flights This will most likely be the largest expense, depending on where your destination is. For a trip overseas, it’s usually the largest. Check out my article on Tips for Cheaper Airfare to see ways to find less expensive flights. Transportation while you’re there – Car rental, subway, bus, taxi, bicycle rentals. Any kind of transportation that you’ll need daily when you’re there. Hotels- Overseas you can save a bundle by booking bed and breakfasts and hostels. Hotels can be very pricey, but if you do your homework, you can save a pretty penny. TripAdvisor is a great place to start to look for hotels and see how much they cost. Check out my article on Secrets to Using TripAdvisor to see how to use this site to find hotel prices. Food per day– This can be a tricky thing to guess and requires a lot of research. If you Google search “how much do I need per day in ______” you’ll get a lot of hogwash. You’ll basically need to figure this out on your own. This is a lot of trial and error. Without any research, my go-to price estimate is $10 for breakfast, $15 for lunch and $20 for dinner. That is a very liberal estimate, but works if I don’t have time to do all the restaurant research up front. Sightseeing- You can do a daily estimate, but I would recommend writing out all the places you’ll want to go and looking up each entrance fee. Depending on the country you’re going to, you could end up spending quite a bit that you might not be prepared for. For example, a ticket to the Tower of London costs 22 pounds, which is actually about $34. Those are the kinds of things you want to be prepared for. Shopping/Misc.– Souvenirs, extra bottles of wine, a scarf, a bottle of water here and there. You’ll have things that come up and you want to have a small budget that is ready to handle a few extras. Guidebooks, walking shoes, travel-related items – These are things you’ll purchase ahead of time, but you want to include this in your trip budget. You’ll need to have good guidebooks and walking shoes. If you don’t have packing cubes or toiletries bag, or a good suitcase… include these things in your travel budget. As far as packing goes, you want to plan for the best case scenario. As far as budgeting goes, you want to plan for the worst case scenario. You want to put on that list everything you can think that you will possibly spend money on. The last thing you want is to prepare for just the bare-bones and then find you you’re $1,000 short and have to start cutting things, like sights you can’t afford or a decent meal in your favorite city. You don’t want to trim things that are important, so budget funds for everything you can think of. The best trick to budgeting is some trial and error. Every time I go on a trip, I keep track of every dollar I spend. This helps me in future planning. I come home and add up everything I spent on food, transportation, sightseeing, etc., and I come home and add that to the list. I have a chart that shows me what I thought I would spend, and then what I actually spend. I have done this for every trip, and now I’m pretty good at knowing realistically how much we’re going to spend. This helps me to not have big surprises when I’m home and find out I actually overspent $1,000! If I’m going to overspend $1,000, I want it to be because I felt like it and not because I didn’t plan well enough. 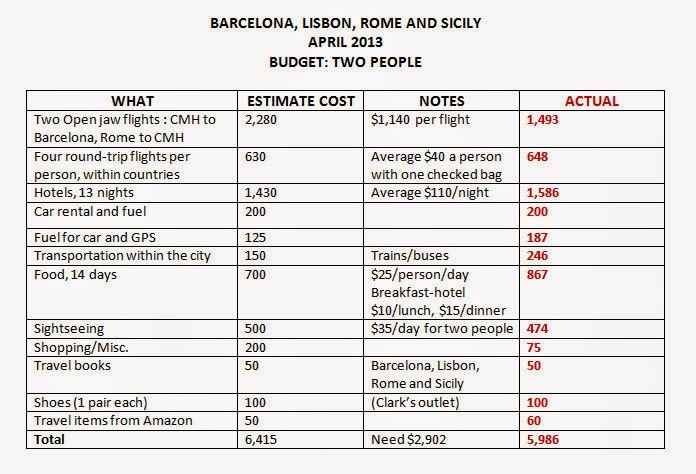 Here is an example of a budget with estimates before the trip, and after the trip. You can see I was pretty close on a lot of them. Some I went over, and some I went under. But by budgeting for what I thought we would spend, we ended up spending about $430 less than I thought we would. That’s $215 a person. For 14 days, that’s an extra $15 per day that we didn’t spend. That money could then go towards the next trip. If after you put your budget together, you’re not sure how you could save for it, check out my article on How to Save Money for a Trip for ideas on how you can save enough money to go on that trip.